This is a guest post by Zoe Archer from the web hosting company UK2. Every day, techies around the world are thinking of new ways to make data storage facilities a little bit more awesome. Whilst some look awesome others are focused on top-notch security, and I wanted to take the opportunity to share some of our favorites with the Royal Pingdom readers. We’ll begin with two European facilities built to military specifications. TheBunker and CyberBunker both offer heavy duty reinforced concrete walls and store all the important equipment underground, to protect it from nuclear explosions or EMP devices. If you’re concerned about someone trying to bomb your webserver, these may be a good option – but I’d hope that most people would have bigger things to worry about if nuclear war broke out. Above left: CyberBunker. Above right: TheBunker. The CyberBunker claims to be able to continue working even if cut off from the outside world for ten years; through I’m still unsure what use a data centre is if it’s disconnected from the rest of the world. I guess it’s still a comfort to know that even though TheBunker is likely to be 90% filled with pictures of kittens, they are protected by Ministry of Defence trained guard dogs. Last year, Tech Digest and the Omaha World Herald both covered stories about forthcoming heavy-duty data centres. These buildings are, respectively, a nuclear waste facility and an ammunitions store. Above left: A soon-to-be data center in Germany (former nuclear waste facility). Above right: A former ammunitions store being converted to a data center. Originally designed to cope with explosions coming from within, these buildings ought to be much safer once they’re crammed full of servers instead. So, just because there’s not much that’s stylish about a metal box doesn’t mean that they can’t be surrounded by interesting architecture. While a Swedish ISP has also headed underground to build a stylish facility that looks like the Devil’s data center, Boston College have converted a former Catholic chapel twice the size of their previous data center. Above left: The Pionen underground data center in Sweden. Above right: Former chapel as a data center (note the windows). Interestingly, the architects of both facilities decided it was necessary to include a viewing platform, presumably allowing power hungry sys-admins to laud over their army of data. Some enterprising engineers have realised that there is no reason why data centers have to stay still. Sun developed Project Blackbox to allow data center facilities to be deployed faster and more compactly than before. If you need a server farm in the middle of nowhere, this is perhaps the way to do it. Google, on the other hand have submitted a patent for a floating data center that uses the sea to generate power and cool their racks. Top: The Sun Blackbox. 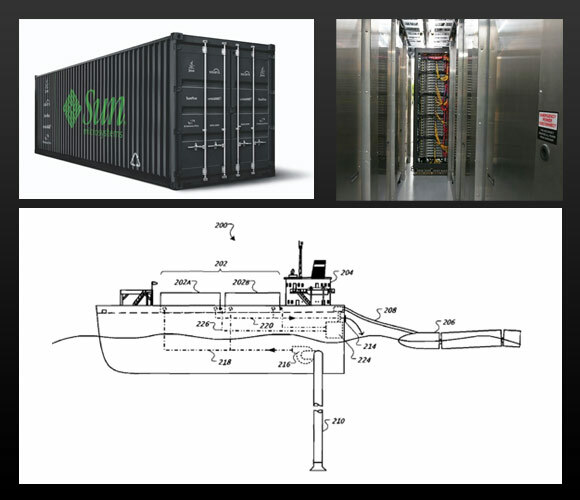 Bottom: Schematic for a floating Google data center. About the author: This was a guest post by Zoe Archer from UK2. They have been in the web hosting industry since 1998, so if you want to talk to them about commerce hosting or dedicated servers, get in touch with them to find out about their data centers. Those are some pretty neat data centers. I really like the one that looks like it’s built inside a church. Lots of light and space, and those beautiful windows.